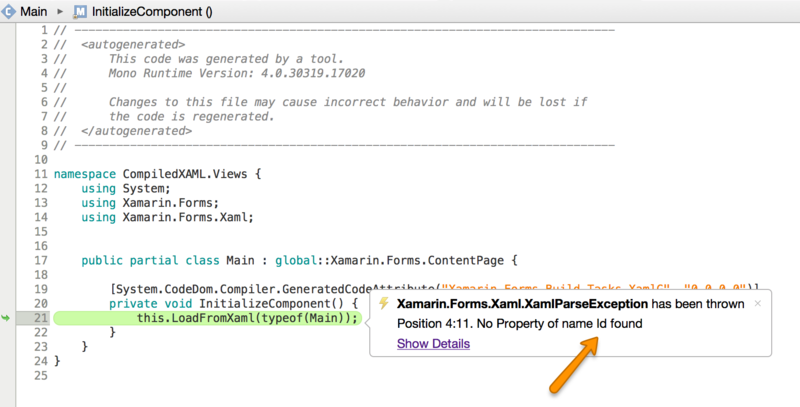 One of the new features in Xamarin 4 and Xamarin Forms 2.0 is the ability to compile Xaml views. First we created a basic Xamarin cross platform project based on Xamarin Forms. Ensure to update the Xamarin.Forms nuget packages to version 2.x. Before Xamarin Forms 2.0 this would compile just fine, and if we didn't do anything to the current project in Xamarin 2.0, compilation will also complete without any errors. If we start the app either in the simulator or on a device, we would get a runtime error. As expected the "Id" property is invalid. As this is a very simple example, this could however be something deep inside our app and not that easy to locate. Locate the App class and above the namespace definition, add the following codesnippet. Build the project again and now the code won't compile, with the following error, but luckily this time, we caught it during compilation. It's also possible to add Xaml compilation to a specific view, simply by added the same attribute as before without assembly: to at the class level of a view. The result is the same as before, except this time Xaml compilation is only enabled for a specific view.